Leave behind your average Dubai vacation, and treat yourself to a getaway unlike any other this spring. 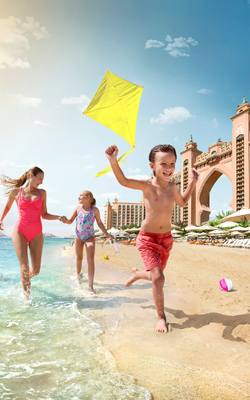 Whether you prefer spending time at the pool, playing arcade games, interacting with marine animals, or diving into a unique water playground of world-record breaking rides and attractions, there are many family activities to do at Atlantis, The Palm – your luxury holiday destination in Dubai. Encounter a truly epic, multifaceted entertainment and recreational venue Wavehouse, which provides innovative entertainment possibilities for both adults and kids. Overlooking Aquaventure Waterpark, this recreation destination’s versatile, dynamic approach to family entertainment includes and combines both indoor and outdoor activities, and offers fantastic dining options in its family restaurant, a sprawling outdoor terrace to unwind, and creative beverages in an adult-only, insta-worthy bar with DJs and high-energy nightlife entertainment. 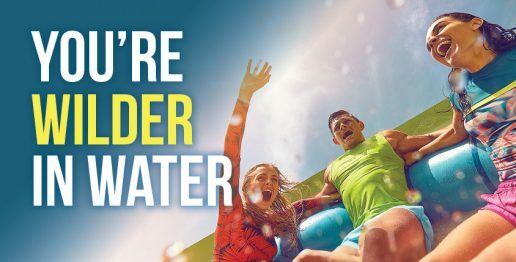 Open all year round, Wavehouse features a wealth of activity for all ages, including the first Surf’s up Wave Rider in the GCC that replicates a real ocean surfing wave with wave technology. There’s over 50 arcade games to choose from at LEVELS, which spans two floors, and is open to all ages. The four-lane ten-pin, licensed bowling alley is a great place to have fun times with family. Make a reservation now to begin your fun-filled spring break at this day-to-night social and recreational destination in Atlantis. Looking for a great place to keep the little ones entertained this spring break? Atlantis Spring Camps in Dubai is the answer. The camp offers kids an exciting programme full of indoor and outdoor activities that give a personal and engaging experience to your little ones. The Young Adventurer camp is specially designed for youngsters who love the great outdoors and offers a wide variety of kids’ activities and sports, including thrilling water activities at Aquaventure Waterpark. There is also a range of amazing scavenger hunts, which encourage kids to pick up the clues to a world of surprises, while keeping them entertained for hours on end. The little artists will love creating their own little piece of art while challenging their imagination and making lots of new friends. No matter where their interests and talents lie, there’s something to keep everyone entertained with a week-load of fun and games! Aquaventure Waterpark has something to offer for everyone. From enjoying loads of adrenaline-fuelled grown-up fun on more than a dozen of our rides, including a glide down Zoomerango – the world’s largest waterslide and a plummet down a 9-storey, near vertical water slide into shark-infested waters, The Leap of Faith – Aquaventure’s scariest and biggest ride, to thrilling rides, wild water games, cool climbing frames and supper slippery water slides for the little ones at the newly opened Splashers Island, Aquaventure will make you rediscover a side to you that you never knew! The waterpark also offers a different kind of thrill with several marine animal experiences including; Shark Safari, a magnificent walk underwater in shark-infested Lagoon; Dolphin Experience, an up-close and interactive session with dolphins; and Cownose Ray Feeding, which involves feeding and interacting with the hungry Rays. 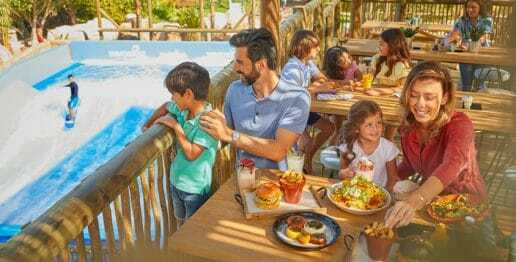 With the UAE Resident Offer when you buy tickets, you can avail up to 40% off at Aquaventure Waterpark. Craft unforgettable memories with a visit to Dolphin Bay, one of the world’s most sophisticated and entertaining dolphin habitats in the world. Get up-close and personal interaction with the friendliest residents of Atlantis, The Palm with a range of Dolphin experiences; each offering more than a chance to bond with the most intelligent mammals on the planet, and is suitable for all ages and swimming abilities. Meet, play and swim with the dolphins in the shallow water Dolphin Encounter; go deeper in the crystal-clear waters of Dolphin bay with the Dolphin Adventure, or a double-dorsal tow and a foot push experience with two dolphins in the Royal Swim; If you are a certified scuba diver, you can scuba dive with our dolphins in the most epic and beautiful below-the-water dolphin experiences at Dolphin Bay. 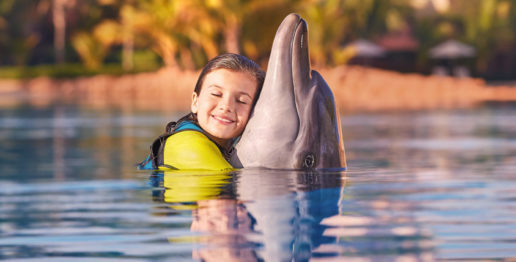 Pro tip: As a hotel guest, you can take advantage of preferential rates for marine animal experiences at Dolphin Bay. If you are planning a day visit, you can save 10% on your Dolphin Bay experience when you book at least 7 days in advance. There is also an opportunity to meet our delightful sea lions at Sea Lion Point, a sprawling sea lion enclosure in Atlantis, which houses the South African Fur Seals – one of the largest species of fur seals in the world. 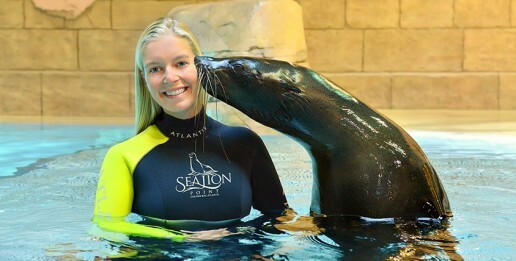 The sea lions here are playful and social, and love having visitors! If you’re looking for something adorable, the Sea Lion Discovery interaction is the perfect activity for all in the family. It’s the best opportunity to get up close and personal with our charming marine animals and learn about their unique behaviours. You can even enjoy special moments with our sea lions without getting into the water, with the Sea Lion Photo Fun; how cool is that! You don’t even have to get wet to learn about sea lions, the Observer Pass lets you watch your family and friends interacting with them from a designated viewing area. Explore a range of beach and pool activities, go quad biking or play beach volleyball. Head down to our beaches for a range of watersport fun! Learn how to surf and paddleboard, or go kayaking around ‘The Palm or go pedalo boating for the ultimate view of Atlantis; there are plenty of perfect spots for that insta-worthy selfie! A place where the entire family can bond while relaxing in its luxurious all-in-one facilities is our Aquaventure Beach. The 700m-stretch of luxurious private beach is open exclusively to Aquaventure and Dolphin Bay visitors and offers private beachfront cabanas and canopies where you can kick-back and relax with your favourite drink or take in the beautiful views of the waterpark’s tropical landscapes in the exclusive reserved seating venue at Neptune’s Retreat. 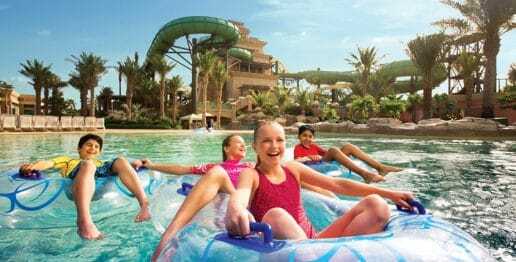 Atlantis Dubai Offers this Spring! Take a look at all Atlantis Dubai Offers available this spring and make sure to try any of our top Atlantis bucket list activities to make your time at Atlantis a memorable one! 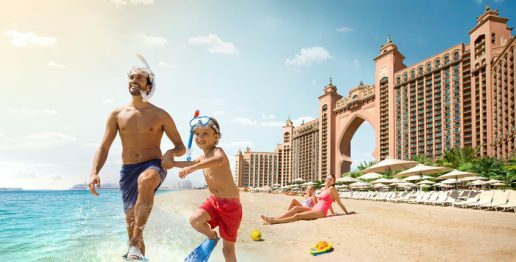 Your next adventure is just a click away at Atlantis, The Palm. 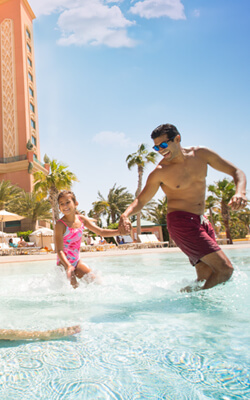 With the Spring Sale, you can save up to 25% off rooms and suites and enjoy complimentary unlimited access to Aquaventure Waterpark and The Lost Chambers Aquarium, and much more! This is a limited time offer. Book now! Bringing you exclusive benefits, experiences and recognition at Atlantis, is Atlantis Membership programme. Book directly with us and enjoy our exclusive Atlantis Membership Rates along with a world of benefits as an Atlantis Member. 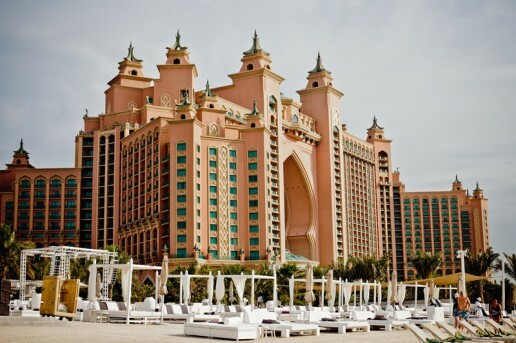 At Atlantis, The Palm, you are guaranteed a world away from your everyday. Come experience it while making a lifetime of memories with your family!